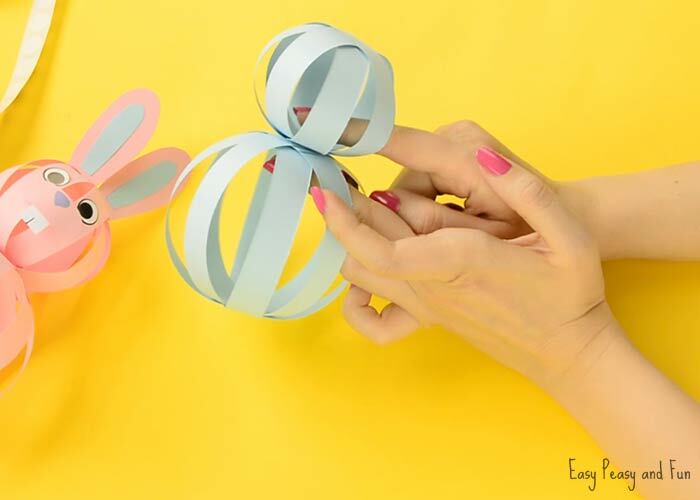 For this holiday though, we opted for baby blue and baby pink colors, fitting for a Easter bunny. 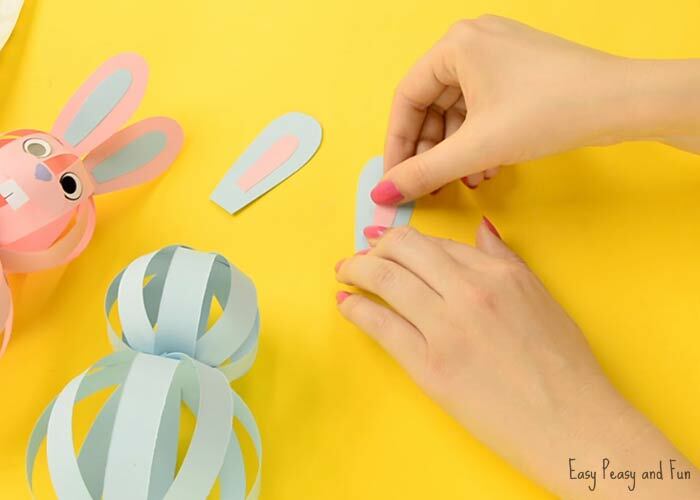 What we love about these bunnies is that they are insanely easy to make and they look beyond adorable. 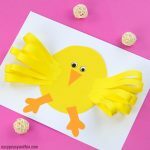 What is even more cool is you can make a whole bunch of these and hang them on a string to make a garland. 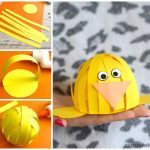 Just imagine this as a classroom craft! 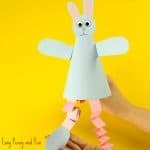 Most preschoolers would struggle with this (they would need help) so you would need to modify the craft to maybe only include the bunny head. This project is more suitable for kids in kindergarten and older (adults included :). 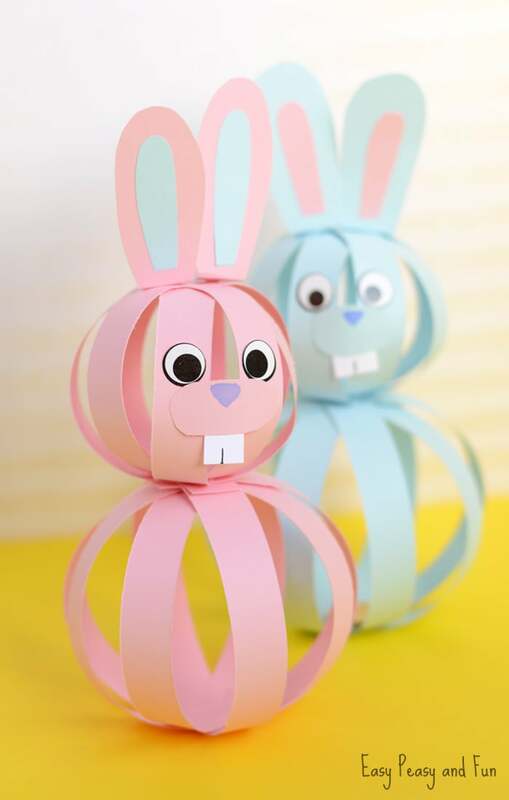 We think these would also make great Easter basket decorations. 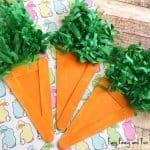 If you would use more strips of papers in the body part, you could also fill it with candy for a nice little surprise for the kids. 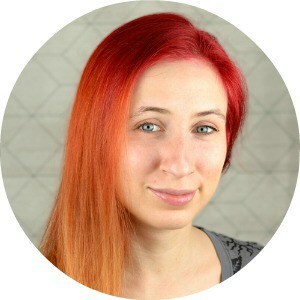 We have prepared both video instructions and photo tutorial. 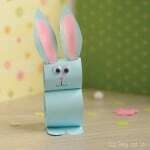 We will be making the pastel blue Easter bunny craft. Cut 4 long strips of paper (we cut along the length of the A4/letter sized paper) and 4 shorter strips of paper (these we cut along the width of the A4/letter sized paper). The width of the strips we used was about the width of a thumb. 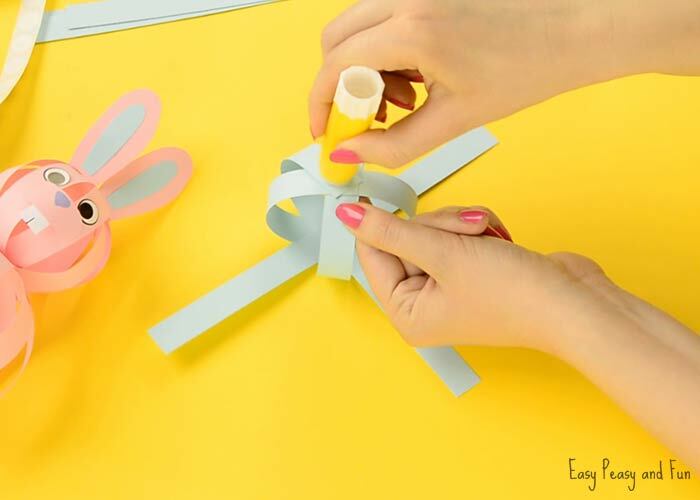 Take the 2 long strips and glue them together making a cross. Glue the other 2 long strips, making a snowflake. All strips must be evenly distributed (no need to be super precise though). Do the same with the short strips. 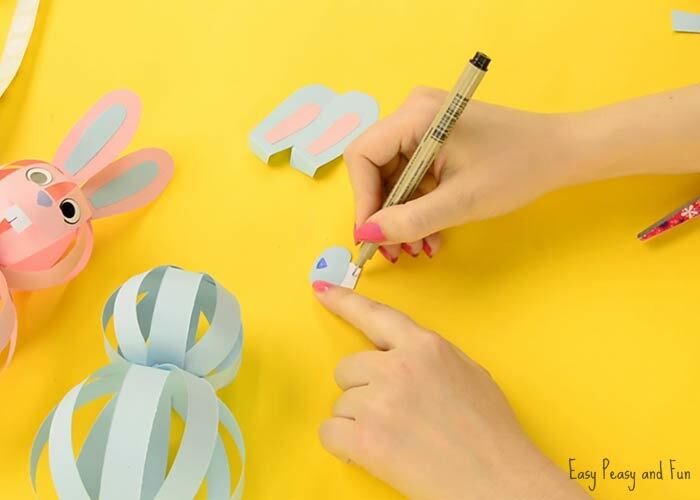 Take the “snowflake” with long strips and start making a paper ball. Glue the strips together, forming loops, until all strips are glued together and you get a nice looking ball. Do the same with the short strips “snowflake”. Now you got two sized paper balls. 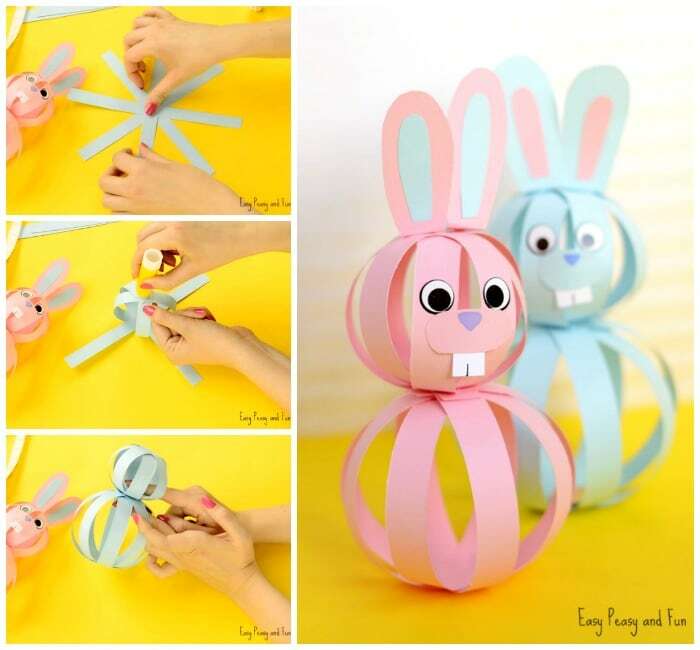 Glue the paper balls together. You might need to hold them together for a while for the glue to really dry. 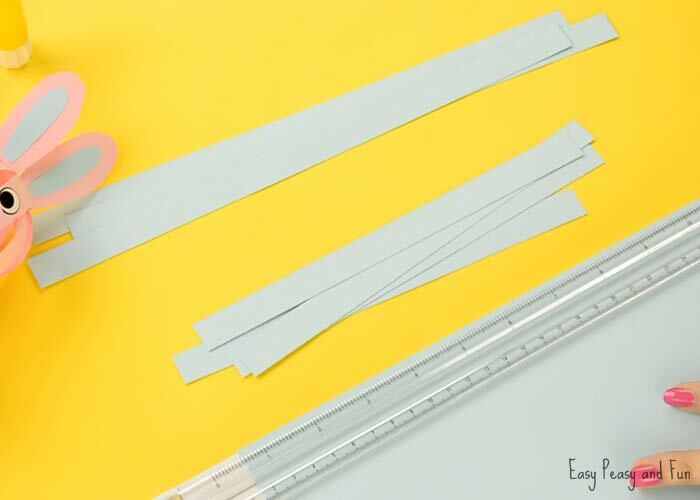 Cut the ears out of pastel blue construction paper. Also cut a smaller set out of pastel pink and glue it inside the blue ears. Cut a snout and draw a nose. Also cut teeth out of white paper and draw a line in the middle with a black marker. Glue the teeth on the snout. Glue the ears and the snout on the head (smaller ball) part of the bunny. Add two wiggle eye stickers. 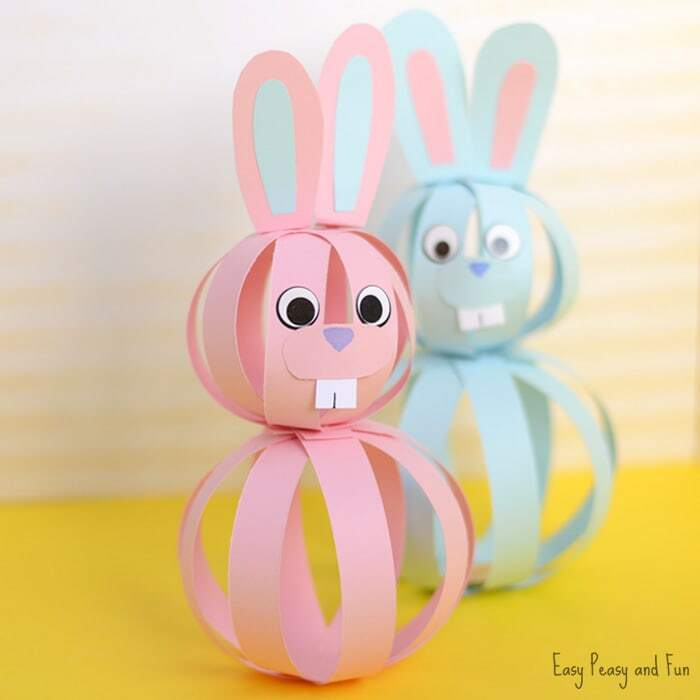 Your Easy Paper Bunny Craft is all done and ready to be displayed. Just tried this with my 7 yr old and it was very fun. We think it would make a cute octopus, if you made the head but left the “legs” unglued. We just made an octopus a few days ago! It is a bit different but still silly and cute – will be posting it on the blog soon. Thank you! 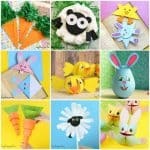 That Easter Bunny craft looked hard to me. It might look a bit tricky but once you try it you’ll see it’s super easy! We had many kids in kindergarten do this project with great success.